Andrew Waterworth scores four, twice in each half. As statements of intent go, that was pretty emphatic from Linfield. Dominant and at times unplayable, they'd have been too good for anyone in the league during that opening half hour. With five games remaining David Healy's side are nine point clear at the top although of course Ballymena United can narrow the gap to six with a win tomorrow. We'll be back here with full text commentary, in-game highlights and BBC Radio Ulster coverage from two o'clock tomorrow. Thanks for joining us, we'll see you tomorrow! I have no complaints with that result. It was fully deserved and we will take it on the chin and move on. Linfield were a different class tonight and you can see why they were six points clear at the top of the table. Quote Message: For me out of all the players I have worked with both in England and here, I would rate Andy in the top two. He is such a professional, and he deserves everything he gets. For me he is probably the top player in the country. He scores goals, he runs too much at times and he will go on and get another medal under his belt with Linfield. For me out of all the players I have worked with both in England and here, I would rate Andy in the top two. He is such a professional, and he deserves everything he gets. For me he is probably the top player in the country. He scores goals, he runs too much at times and he will go on and get another medal under his belt with Linfield. It's a big performance going into the split. We started at a good tempo and got the goals at the right time. In all the success we have had at the club since I have been here Andy Waterworth has been a big part of it, by his own admission at times he should score more but when he gets in the positions he is hard to beat. I think we clicked tonight. We have been off-colour of late and tonight we clicked. I love scoring goals and to score a hat-trick is the best. It's the best we have played in the past two months. We took it by the scruff of the neck tonight and made sure the gaffer didn't have to sweat too much. For my money, that's Linfield's most impressive performance of the season. Dungannon are no mugs but Linfield absolutely blew them away in an opening half hour in which they found the back of the net three times. Andrew Waterworth got four, scoring twice either side of Jimmy Callacher's header. They look every inch the real deal as they head into the split. Shockingly, four-goal Andrew Waterworth is named man of the match. Linfield are heading into the split with a fairly healthy lead at the top and on tonight's showing they're gonna take some stopping. We are into the last minute of the 90 at Stangmore, where there are still a few Dungannon fans hoping for a cheeky six-goal turnaround in injury-time. Kirk Millar nearly adds a sixth as he connects with Chris Casements venomous free-kick but it's deflected behind for a corner, which is duly cleared. The hosts nearly pull one back as Jarlath o'Rourke flicks on Rhyss Campbell's goalbound effort but Gareth Deane keeps it out. Lovely cross from Kearns as Linfield's frontman helps himself to a fourth. Here's how Waterworth got his third. Off comes Andrew Waterworth. A good night at the office for the Blues striker. What a brilliant goalscorer he is. He'll not complain but I bet there's part of him thinking that he could have had a double hat-trick if he had stayed on. Great ball in from Daniel Kearns and once again Waterworth is one hand to apply the finishing touch from close range. 10 hat-tricks for the prolific striker. And still Linfield come forward, although momentarily the final pass has evaded them as a few moves beak down near the box. This game, with the result signed and sealed, is in danger of sleepwalking its way through the last 25 minutes or so. 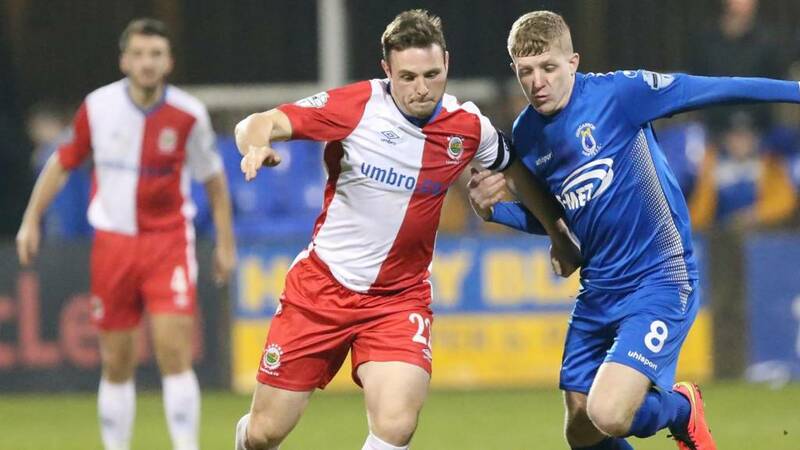 Can the Swifts grabs a consolation or will Linfield put some more gloss on the scoreline? Paul McElroy looking for an instant reply but his fizzing left-footed effort goes just wide of the far post. Head tennis in the box and it comes the way of Andrew Waterworth at the back post who grabs a hat-trick from close range! Three headers won in a row by Linfield there, Kris Lindsay will not be happy with that. Yeah but you'd rather be at Stangmore right Rich?